As the fifth season of NBC’s Scrubs winds down, the third season comes out on DVD. 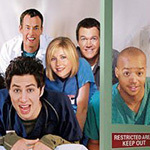 By now I’ll assume you’re up to speed on what Scrubs is (check the sidebar for previous seasons). The third season is the one where Elliot gets a new ‘do and dates an old boyfriend, J.D. dates Dr. Cox’s sister-in-law, and Carla and Turk get ready for their wedding. The quality of the writing seems constant; the third season is as just as good as what has gone before, plus it has the advantage of familiarity. We already know and like these characters, and now we can really start getting to know them. We’ve watched them grow from their awkward initial incarnations into the solid, well-grounded people that the writers and actors have (more or less) settled on. Elliot’s transformation was a little jarring, but luckily she wasn’t allowed to become someone else. It’s interesting to note that in the extra features, the producers acknowledge that Elliot’s transformation was a top-down decision from NBC to make the show (and Sarah Chalke specifically) more “marketable.” But they only mention the home office once and then go on to justify the decision as though it were their idea to begin with. In any case, it didn’t ruin the show, although for a few episodes we had to wonder whether Scrubs was going to lose it completely. The third season of scrubs comes on three DVDs. The extra features are all conveniently located on the third disc. The sheer volume of extra features is impressive, but not intimidating. It might take you an hour or two to wade through them all (barring the audio commentaries). Collectively, they are worth watching because of the funny moments sprinkled throughout. Individually, some segments are stronger than others, and the audio commentaries should probably be avoided altogether. “The New Elliot” explains and illustrates the big change in season three, and it’s more informative than most of the features. “Scrubbed Out: Deleted Scenes” is another above-average feature, with scenes that must have been cut for time, because they’re good enough to have been in the show. Then there are the “lifestyle” featurettes. Those who work on Scrubs are allowed to bring their dogs to work. (Hard to go wrong with video footage of a box of puppies.) And then there are the disgusting dares they called “Scrubs factor” (like “fear factor”). Rich producers pay crew members to humiliate themselves by, basically, eating bugs. It’s the playground all over again, and another reminder of why you don’t want to work in Hollywood. The gag reel is fun; it’s a collage of actors flubbing their lines. “Don’t Try this at Home” is a collage of all the pratfalls. “Long Term Residents” is a parade of the show’s guest stars (Erik Estrada, Michael J. Fox, and Brendan Fraser, among others). And then there are the personality profiles. Robert Maschio (The Todd) goes on camera about his role. “Twist and Shoot” introduces us to the guest directors promoted from within. And sprinkled throughout are interviews with the cast, crew, and producers of Scrubs. And if you ever wanted to hear the theme song all the way through (and not just the 15 seconds or so that plays before each episode), just pop any disc in the player and press Menu. The theme song is allowed to run its course. Non-fans will have little reason to contemplate buying or renting this DVD set. Therefore, if you’ve made it this far in the review, I can recommend Scrubs Season Three without hesitation, not just for the show, but for the worthwhile and well-balanced extra features. Bring on Season Four!